Handcrafted Wine. Modern Casual Dining. After four years of planning and construction, Cooper’s Hawk Winery & Restaurant opened in 2005 in Orland Park, a south suburb of Chicago. The concept was unique. We would create a signature menu with a selection of dishes designed to pair perfectly with our own Cooper’s Hawk wines, made in our own private winery. With sophisticated food and exceptional wines, our concept was born. 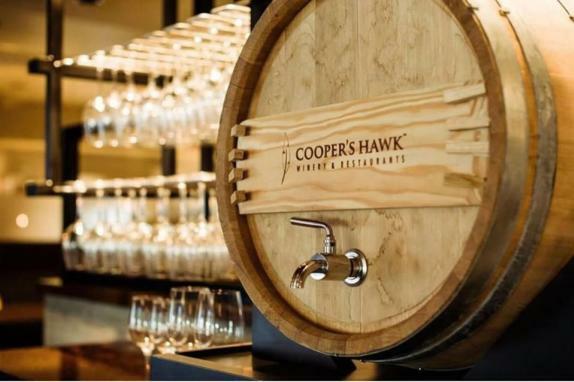 The Cooper’s Hawk concept includes four distinct components: an upscale casual dining restaurant, full-service bar, private barrel-aging room, and Napa-style tasting room and retail gift store…all under one roof. Each Cooper’s Hawk location is distinctive in layout and décor, but carries the same warmth and elegance that guests have come to expect.